Do you have a food memory or sensation from childhood you wish to replicate? While I love savory, there are some old time sweets I will forever crave. For this twin post sequel collaboration with Anuradha @bakerstreet29, bakerstreet29), my twitter daughter, we exchanged a myriad of emails, went through countless frustrations as we were looking for recipes, emailing and dm'ing links back and forth. I even went on a spying (that is where the wandering part of food wanderings plays a part) mission to Whole Foods as I thought their version was probably closest to what I was looking for. I googled two other European bakeries in Arlington, VA to see if they had images online I could study, but life is so hectic I never made that excursion to Randolph and Heidelberg bakeries. It was more of a chemist, engineer and architect hybrid mission as I was interested in the design, construction and ingredient balance and ratios of the recipe. Ratios I never got, but found out Whole Foods had almonds in theirs so I never ended up buying it to dissect in my cramped up kitchen 'laboratory' quarters. ...but let me back up, as twitter mother and daughter, a year later, with my hang up on the right recipe, did Anuradha and I do some bonding. She is a good daughter. Just like Sagie claims his independence while being respectful and loving. You might remember the epic Apple Rolled Oats Streusel Cider Muffins - Twin Post from October 2010, Anuradha and I published in tandem, and there you will find the tale of Anuradha becoming Fifi, my long lost daughter. You might know her wonderful Muffin Monday initiative. Muffin Monday created much enthusiasm and many friends participate. As the weekend winds up and instead of the Monday blues look forward to the week with Muffin Monday filled with excitement. I knew I wanted a torte peanut based cake batter, something about that crunch, color and nutty flavor depth it adds to the profile of this cake. I also knew I wanted whipping cream as opposed to butter cream. I am more partial to whipping cream and it's in the original recipes I grew up on anyhow. As you can see this can be tricky working with whipping cream to support a structure of layers. I baked two cakes for four layers total, Since I was working with whipping cream and had very little experience with layered cake, with some exceptions of baking stints as a teenager, I decided on using only one cake, two tier total. Trying to be extra cautious but it was perfect. Anurandha went with peaches and cream and more of a yellow American style cake base, YUM. You can read in her post about her decision making process. Growing up we baked both versions, one with fresh strawberries and one with canned peaches with peanut torte or chiffon (or white) cake bases. We give you two wonderful takes on the same cake. Tips: Egg whites meringue cake batter cannot be whipped into a stiff peak or the cake will come out dry, whip them into a soft peak. The tortes cannot be over baked or they would be too dry. Luckily I had a good sense to me and didn't believe the directions in the recipe which asked for 55-65 minutes at a medium heat. To moisten the cake layers I used simple syrup, 1sugar:1water. I was over cautious with drenching it with syrup, I didn't want the layers to be soggy. Honestly if you make this cake in advance and let it sit in fridge for 2 days, the moisture seeps in and the cake is super moist and decadent. If you plan to serve it immediately after chilling for few hours or next day, I would add a couple extra tablespoons of simple syrup to each layer. I used 3-4 tablespoon. If it's for a couple of days later then I would just stick to 3-4 tablespoons of simple syrup per layer. I love, just love Spanish peanuts, they are hard to come by here. I get the roasted and salted ones at Wegmans and whiz them in the food processor with skin on. I skip the pinch of salt called for in the recipe when I use salted peanuts. Feel free to use skinless peanuts, roasted and unsalted. If you do so add a pinch of salt to the batter. I garnished with semi sweet small chocolate curls I shaved with a potato peeler. You can instead sift on top some cocoa powder before you arrange the strawberries on the cake. Pre heat oven to 350F. Grease a round spring form 9 1/2" cake pan. A 9" or 10" spring form cake pan should work as well. It will just produce a slightly higher or slightly lower cake. I greased the pan, parchment papered it and greased the parchment paper. Just wanted to ensure a complete success. If you are a more confident baker the parchment paper step isn't necessary. Whip the egg whites in a a large bowl and add sugar in 3-4 batches once a foam starts forming. Whip into a soft peak. Add in a separate bowl the yolks, 1/4 cup sugar, oil and vanilla. Whip together. I whip all ingredients until mixed well with egg white whisk. No need to wash. Fold egg yolk mixture into egg whites gently in few strokes. Mix all dry ingredients in a separate bowl and add to egg mixture in three batches. Fold gently to incorporate batter together. Pour batter into greased cake pan and bake at 350F for 30-40 minutes. Cake will be golden. Test with a skewer. If skewer comes out dry without crumbs when sticking in the middle of cake, then the cake is done. Let cake cool down completely before releasing from cake pan. Once cooled, slice cake into two layers, right into the middle, with a serrated knife or bread knife. You can assemble cake same day or next. Can be kept refrigerated overnight. Mix over medium heat and let sugar dissolve completely. Take off heat and let cool. Can be made ahead and kept refrigerated. 1/2 the strawberries slice (see photo) sprinkle 2 tablespoons of sugar, mix, cover bowl with plastic wrap and let macerate, outside or in the fridge. The other 1/2 of the strawberries keep whole, stemmed, in a separate bowl. Add 2 tablespoons sugar, mix, wrap bowl with plastic wrap and let macerate outside or in the fridge. Whip whipping cream with sugar to a stiff peak. cover bowl with plastic wrap and keep refrigerated until assembly. I worked with a 9" angled frosting spatula. I took the top layer of the cake, flipped top 'belly' side down, wet with 3-4 tablespoons simple syrup. Cover layer with macerated sliced strawberries and some of the juices. Leave some sliced strawberries for decorating the base of the cake later on. Add 1/3 of whipping cream on top of strawberries, even and smooth layer on top with the spatula. Press whole macerated strawberries into whipping cream stem side down along the lines as illustrated in the pie to the left. Leave about 5 whole macerated strawberries for decorating the cake on top later on. Moisten second cake layer bottom side down with 3-4 tablespoons of simple syrup and place on top of whipped cream and strawberries bottom side up. Basically the original cake is now upside down. Coat top of cake and sides with some of the whipping cream, this is called the crumb coat so it does not have to be perfect. Place in freezer for an hour. Take out of freezer and coat entire cake with the rest of whipping cream smooth and straighten with the spatula. You can put markers for slicing later on, along the lines as illustrated in the image to the left, so you cut strawberries right in the middle when serving. Visually it will have a wow effect. Place in freezer for 20 minutes. Shave garnish on top of the cake as mentioned below. Press macerated sliced strawberries gently along the base of the cake into the whipping cream. See three first photos as illustration. Arrange whole macerated strawberries in the middle, on top of the cake, as shown in photos. Place in freezer for 20 minutes and move to refrigerator until serving. Do not shave chocolate in advance. It will melt with a touch of your fingers and body heat. Shave it directly on top of cake with a potato peeler once the cake is frosted and cooled. I ran the potato peeler along the thin edge of the chocolate bar. It will create small little cylinder chocolate curls. 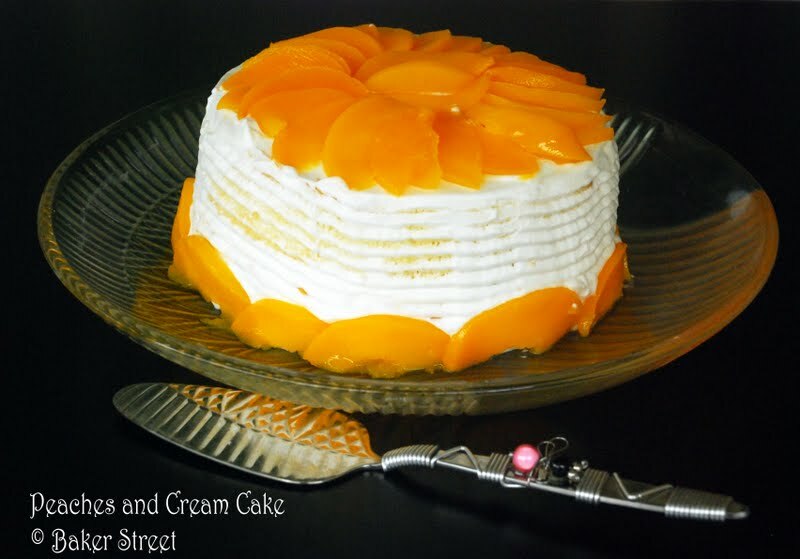 Please hop over and check out the twin Peaches and Cream Cake post at An's site. I loved every step of the way. I know there were some trying times but that just got us closer. Those 2 am conversations are all worth it. Gorgeous, gorgeous clicks! I only wish we could have also tasted each others cakes. lol. Had a lovely time putting this together. PS: I'm already thinking of ways to top this one. Tough, but i'm sure we'll come up with something. Love this luscious cake and all your recipes. Please adopt me. Looks down right delicious! I love the path you took to get this recipe. Shulie, you and Fifi are adorable! What a beautiful cake! Looks so yummy and delicious. Very well explained. Loving this Twin posts from mother & daughter :) Wish I could have had a bite of both the gorgeous bakes. Wow! you sure outdid yourself here, Shulie! I'm off to go check out An's post now! You know I've been craving this cake since I saw the sneak peek! And now it's here! Love it, plus great tips about the egg whites! Going to check out An's cake now! Oh that cake is just beautiful!! I have lots of food memories I'd love to recreate...you've got me thinking. this is beautiful. love the strawberries and cream here! whoohoo for twin posts! Gorgeous cake. I wish I could have a slice! so pretty! I want some now too! SO beautiful!! Both of your versions ( Anuradha's and yours) are perfect. Layers, cream, the fruit, the assembly- all of it- gorgeous. So beautiful...both of them. I LOVE decorating cakes with a lot of care; letting guests know how special they are. This would surely do it Shulie! Shulie, you have outdone yourself on this one - absolutely stunning - both of you!!! Ahahaha Fifi peeps need to read what I compared this process to on your post. lol All come over made individual cakelettes for everyone!! Thank you for all your kind words and stopping by taking the time to read and comment. The cake was everything I was set to achieve. Absolutely delicious! Oh how I love the friendships we all form online. You and Bakers St. have something special. This cake is splendid! I just love that you and your "daughter" did this together - sweet posts on sweets! Plus, strawberries and cream is one of my favorite combinations. Wish I had this cake in front of me right now. Thanks for linking up to our #cakelove dear! Gorgeous cake! "so I never ended up buying it to dissect in my cramped up kitchen 'laboratory' quarters" you are too funny, Shulie! I didn't know Anu was your twitter daughter. Your twin posts are both beautiful! יאוווו שולי אני לא מאמינה איך פספסתי את הרשומה הזאת שלך. יש לי את הספר (החרמתי אותו לדודה שלי לאחר שגיליתי אותו אצלה) אבל.......... מה שאני רואה אצלך זה ליגה אחרת לגמרי!